In this talk, Terence McKenna tells some stories about how Gordon Wasson was first led to investigating the mushrooms of Mexico, and of possible use of magic mushrooms by the Sufi’s. We also get to hear one of the rare instances where the bard McKenna gives us his opinion about 5MEO-DMT, as contrasted with his primary psychedelic substance of interest, NN-DMT. Going on, he speaks about drugs grown out of cultured amphibian skin, and about ways to enhance certain psychedelics. At one point Terence takes off on what can only be called an anti-Myan rant, something I haven’t heard him say before. This talk also contains the most detailed and specific accounting of what he thinks would happen on December 21, 2012 that I have ever heard Terence McKenna give. 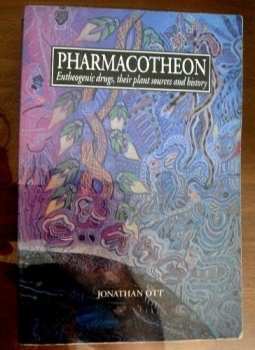 Posted in 2012, Ayahuasca, Books, Cannabis, DMT, Eschaton, Future, Psilocybin, Psychedelics, Terence McKenna (mp3). Too much info on Sasha and MDMA to come up with a good search on plant based analogs to MDMA as was mentioned in the podcast. I assume we are not talking about sassafras. Recommended search terms? How have I missed this comments feature in all the time I’ve been following the podcast? I blame Iphones! I like what James Broton said! Why are we not funding this?? MDMA is pure powder form, while ecstasy is in pill form and generally contains some adulterants like caffeine aside from MDMA. At least, that’s how I see it. Regarding the MDMA and ecstacy quote, maybe he thought at the time that ecstasy referred to MDA? I share TM’s misgivings on ecstasy. I know Lorenzo and others see it in a more positive light. I guess it is another example of people responding to a particular compound differently, like the example given in the talk of cannabis. Similarly for 5MEO. “Yeah, but how much time have you spent LOADED? That’s the important question!” – Terence we miss you. Do you know what really happened during the morning of December 21, 2012? As you may know, an important part of the participants of the Occupy movement have been influenced by the Zapatistas. Right now, Mexico is in open revolt again, just like 100 years ago, and the Zapatistas are like a beacon of light in the midst of darkness. Right now, a war is been waged against us, the people of Mexico, and this Drug War is being waged mainly from the USA. We have to build new bridges of communication and understanding between Mexico and the USA, and start a new dialogue that can bring about the change in language, culture and consciousness we need in order to overcome the present situation. I’ve been wanting to say this for some time, but finally this podcast brings the subject completely to the table. If the US psychedelic community can be a bit more conscious about the real problems going on, especially in its own planetary neighborhood, new light and creativity could be brought about. So, lets start that dialogue! A big hug from Mexico! –If you want to know more about the Zapatistas, you can read the Sixth Declaration of the Selva Lacandona (http://enlacezapatista.ezln.org.mx/sdsl-en/) or see updates in Enlace Zapatista (a seminar on critical thinking against the hydra of capitalism will be held in San Cristobal from May 2-9). Just like contractions come in waves during labor movement happens in waves Terence set his date at high tide it’s hard to see a different in water level ten minutes arter. Can’t we engineer a frog or toad to produce N,N-DMT ? if u can have toads that produce 5-MeO-DMT, N,N-DMT might be possible right? @ 22:45 “Ectasy is a syntetic, related to MDMA which is ANOTHER syntetic…” … arent they the same thing? There may not be hard evidence of Wasson’s involvement with the CIA, but it is no secret that he was the vice-president of J.P. Morgan & Co., which in and of itself, raises all sorts of red flags. Where’s the hard evidence, Charles? There is also a burning man regional in cyberspace. You can learn about it and how to take part at http://www.burn2.org . I find cyberspace to be a place of great freedom and empowerment. We are most definitely living in a novel reality. Wasson did not have real involvement with the CIA. Jan Irvin may have honest intentions, but his own research just shows passing connections of little consequence and Irvin then takes these connections and blows then way out of proportion. It seems like an intellectual paranoia very reminiscent of what Alex Jones and his ilk suffer from. Would be helpful if Lorenzo did a little digging around on Wasson’s CIA links.